New KwikFit gate hinges are the perfect choice for lightweight gates around the home.Whether you are after a reliable, standard pivoting hinge or the convenience of a spring-loaded self-closing model, KwikFit has you covered. Made using our proven glass-fiber molding technology, KwikFit hinges won’t rust, bind, sag or stain.What’s more, they feature special fitting legs that make it easy to align the hinge on gate and fence corners. Screws then fix the hinge in place on two sides of the post and gate for even greater strength and security. 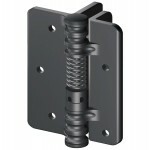 KwikFit hinges are quick to fit, will last a lifetime and represent great value!